This book contributes new insights into the organization of free/open source (F/OS) software communities by examining the links between learning, division of labour and commercialization, demonstrating the need for a synthesis of work on both community organization and cooperation to understand F/OS community dynamics. These aspects are examined in the light of detailed case studies of the GNOME and KDE projects. This book offers an innovative theoretical framework, a critical assessment of various methodologies for examining the organisation of F/OS communities, and a typology of commercial involvement in F/OS. The analysis reveals the diversity and evolution of F/OS communities and their connections with other socio-economic networks and institutional practices. The insights afforded by the book have implications for future research and the design and implementation of open source efforts. 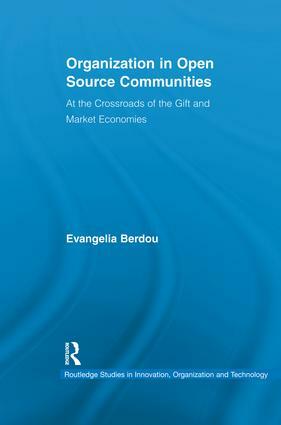 Evangelia Berdou is Research Fellow at the Institute of Development Studies at the University of Sussex. She completed her Ph.D in the Department of Media and Communications at the London School of Economics and Political Science in 2007. Her thesis was awarded LSE's Robert McKenzie prize. Her Ph.D research was sponsored by the Greek State Scholarships Foundation (IKY) and focused on dynamics of commercialization and peripheral participation (integration of new developers and participation of non-programmers) in mature, community-led Free/Open Source software communities. From 2004-2007 she worked as a research assistant in the DBE (Digital Business Ecosystem) and OPAALS (Open Philosophies for Associative Autopoietic Digital Ecosystems) European funded projects.